Nurse taking pulse of patient in their bed at home. This week NHS Providers published a report: “Steeling Ourselves For Winter 2018/19” To summarise, the paper indicated that the problems encountered during the previous winter are likely to reoccur. The increase during this period as regards to unplanned admissions via A&E, ambulance and Walk-in centres are prioritised at the cost of elective procedures. Last winter NHS Improvement estimated that 22,800 elective admissions were either postponed or cancelled as a consequence. NHS Providers concurs that hospital beds might be released through improved patient flow by means of increased use of out of hospital care. 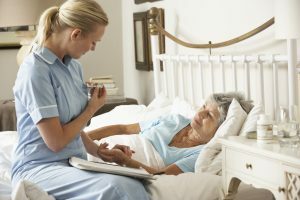 The cost benefits of an increased flow of elective procedures in tandem with a greater mobilisation of at home care have been robustly proven to significantly ease the loss of income incurred by NHS Trusts in these testing circumstances.